Manage your content, your users and your school identity. We all need more things in our lives that are easy. Although it's easy, we're here if you need us for anything. 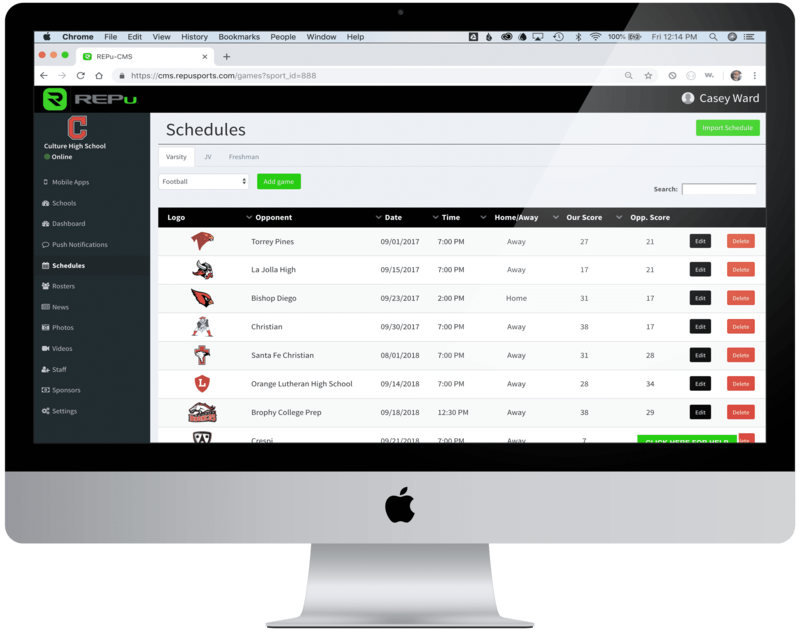 The moment you start to use the REPu Content Management System (CMS) you'll quickly realize it was designed by coaches and athletic department staff. It's incredibly easy to use and doesn't require IT to get involved. The REPu Management System is used to administer all of your sports content and automatically updates the mobile app and the website at the same time. Do you have coaches who are passionate about coaching and want to promote their sports more? What about band, robotics and all the other great programs? The REPu Fan Engagement Platform was designed to ease the workload on the athletic department by enabling secure access for the coaches, staff and even parents to manage and promote their sports and activities. We give you the tools to maintain full control and spread the responsibility of maintaining content across all your sports. No more dealing with multiple tools and websites just to manage your content. We've put everything you need to easily manage your content under one roof. The REPu Management System is the place to go to manage photos, videos, news articles, rosters, schedules, scores and just about anything else you can think of.